Spanish Immersion Courses: For you 2 lessons Gratis. You can compare High-Quality, Comfort, Safety and Prices with all the Spanish Schools in Malaga. Prices Spanish Courses 2019: at Alhambra Instituto (Malaga, Spain), we keep our costs as reasonable as possible while still providing you with top-class facilities, qualified teachers, all classrooms exterior with the latest in learning technology (interactive smart boards, multimedia). All our prices include the organization of accommodation and the activities, but exclude enrollment fees. One class/lesson in all our Spanish courses takes 55 minutes. Enrollment fee included. Material fee not included. NOTE: The transfer service will have a 50% surcharge from 0:00 to 7:00. In case of both ways service, the surcharge will be applied proportionally. Enrollment fee: 40 € (for a 1-week course, the enrollment fee is 20 €) The enrollment fee is valid for 2 years. Included: grading placement test for non-beginners, tutorial services and academic advice, certificate of attendance and pedagogical report. Over the years Alhambra Instituto has been providing Quality Spanish Language Courses for students at extremely good rates. But as low as our prices are, it does not affect the quality of teaching you will receive when you come to study with us in Malaga-Spain. You see, we believe, that everyone should be able to study Spanish. 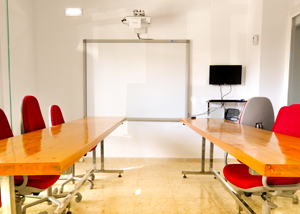 The first Spanish School in Malaga and Andalucía with fully air-conditioned building with interactive whiteboards in each classrooms to enhance teaching and learning the Spanish experience. They save a lot of time of the teacher and students. We integrate technology into the Spanish lessons because is an effective way to connect with students of all ages, learning styles and levels. Helps students stay engaged. In language learning, the traditional passive model is broken. Today with technology in the classroom the Spanish teacher becomes the encourager, adviser, and coach.